Gia joins our team with as an experienced stylist from San Diego, California. 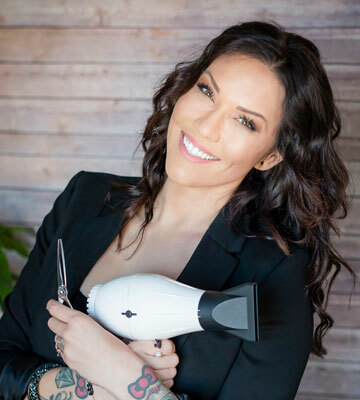 Gia has earned degrees in both project management and philosophy, but she decided to pursue her true passion of doing hair and graduated at the top of her class from the Paul Mitchell Academy. Our guests simply love Gia for both the great guest experience as well her attention to detail, she delivers superior results every single time. Gia looks forward to a long term term relationship with every guest. When Gia is not in the salon she enjoys spending her time with her husband and her fur baby Gypsy, and is an avid reader of self reflection and interpersonal books. Oh and she loves cake! Gia currently serves guests on Tuesdays 8:30-2:30, Wednesdays 3-9, Fridays 7:30-1:30, and Saturdays 7:30-3:30.